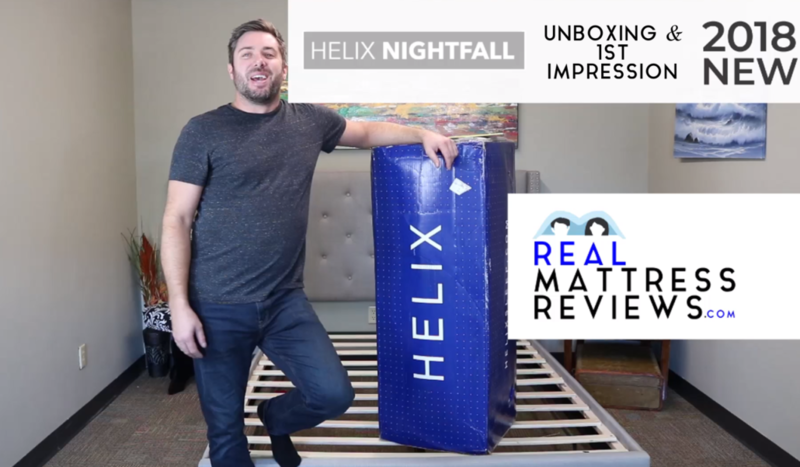 Helix Nightfall Mattress Review - The Best Mattress for Heavier Sleepers? 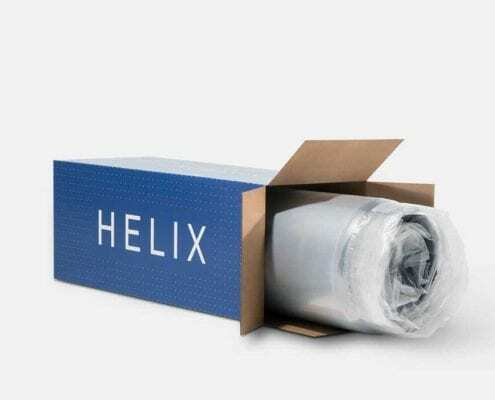 Helix is a well established company and have expanded their line. This model is beefed up for heavier sleepers or those simply seeking a longer lasting mattress. 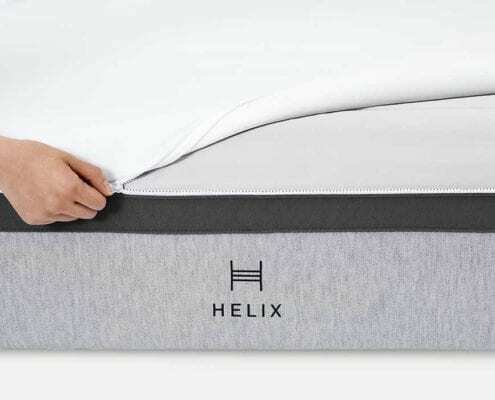 The Helix mattress is a suave and sophisticated looking bedding that has been designed for the plus sized among us. Those who are big and/or tall will love the maximum support it provides – or so the company promises on their site, at any rate. Obviously we wanted to test out these awesome claims for ourselves! 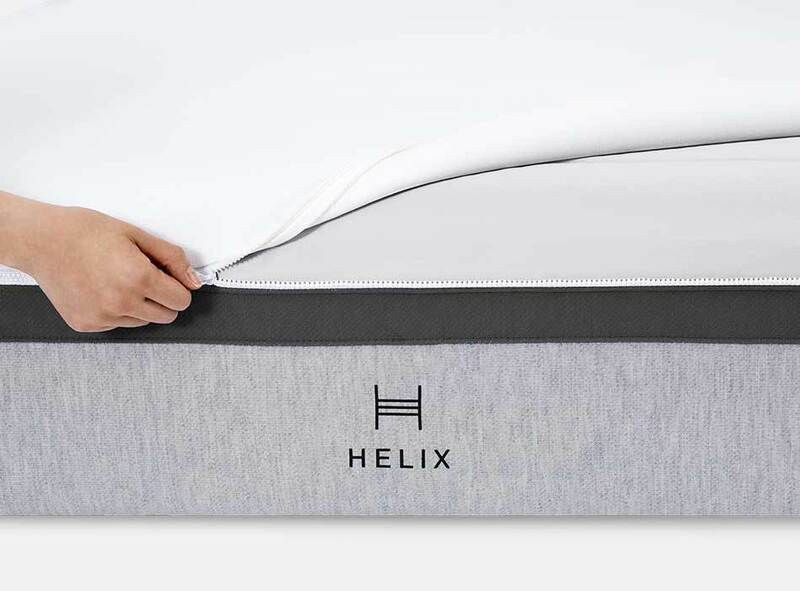 The Helix Nightfall is a hybrid mattress, meaning it uses a combination of spring and memory foam support to mole to your body and help you get a good night’s sleep… but is memory foam dense enough to support the extra weighty? We took a closer look to find out in our Helix Sleep mattress review! This brand are very on-point when it comes to branding. 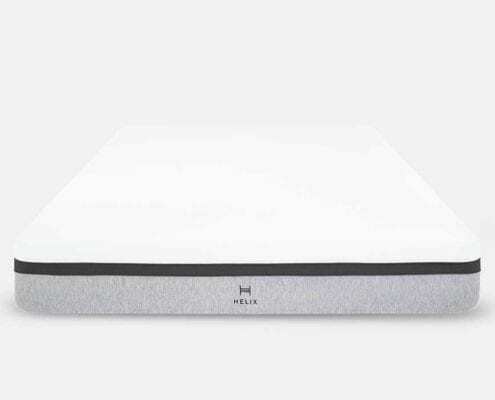 Helix Sleep have a whole range of other mattresses for you to choose from and the Nightfall is a highly recommended model. Helix went out of their way in the early days (and still do even now) to gather personal data from consumers by having them fill out a questionnaire regarding what the client actually wants from a mattress. One of the main points that repeatedly arose was price; and so Helix set out to make mattresses for under that dreaded $900 price point. After they made that decision they went on to create a huge fan base of their own simply through listening to the customers wants. Most other brands could learn a thing or two from them. The range are sleek and stylish, the mattresses are well thought out and adapted to the individual and what they require. If the Nightfall isn’t good enough for you there are a whole host of other options. Not only that but the website is ideally constructed to give you the best images of the mattress and immediately letting you know how affordable the mattress is. 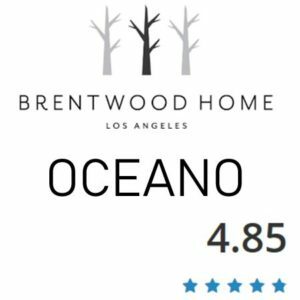 They have reviews on their site which we like as it reflects honesty, and they have nicely arranged all the key points for the consumer. We like their branding. They did very well in this category. The Helix boasts that they will deliver between 3 and 7 working days from the time that you order, which is a little quicker than the standard 8019 working days that we have come to expect, so well done there. The mattress will be delivered rolled up and vacuum sealed in plastic which has then been packed into a box. This makes for easier transportation and allows them to keep carbon emissions down. Once it arrives you should take it into the room you want to place I tin before you un-box. This will save you having to lift and move it when it is expanding. Next, take a sharp tool and cut away the box, then the plastic – being careful not to cut through the cover of the bed as you go. Once your bed has been freed of its packaging it will start to expand, so step back and watch it grow! Your mattress will be fully expanded within 24 hours but you will be able to use it before then. We would recommend unboxing first thing in the morning to give it time to settle before you lie on it. However, once it is unpacked you can put your sheets and mattress protector on and getting snoozing! 1. Are of a heavier weight and need a mattress built to match. 3. You like a medium scale on the firmness level. 4. 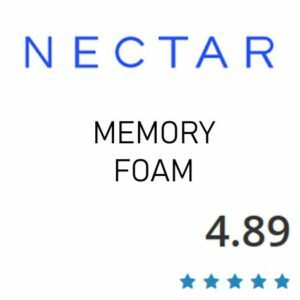 You want a hybrid mattress that retains the envelopment of memory foam but is not overwhelming. 5. Sleep hot. Every single Helix mattress comes with their patented temperature regulation techniques that work to keep you cool in the night. 1. Prefer a full foam bed; the coils in this mattress prevent this. 2. Like a soft or firm mattress – the medium firmness of this mattress might not be for you. 3. Sleep cold – the temperature regulation will work against you here. 4. Are a stomach sleeper; the foam is high density but still foam, and sleeping face down on memory foam is never very pleasant. On the upside at least your face will be nice and cool. The Helix Nightfall has a specially designed cover that proves their ability to listen to consumer demand. They have split the cover into two, which is part of the reason that the bed looks so stylish. With a light Grey bottom layer and a blue top layer that each have different qualities we can’t help but feel that they nailed it in this department. That plush and comfortable top layer is soft to the touch and stretches with the foam,whereas the bottom layer is made from a more breathable, light fabric which promotes better airflow. The spongy memory foam of this bed is dense but medium on the firmness scale. This is for heavier people who want a supportive bed they can sink in to. If you are looking for a tough mattress with springiness then this might not be the model for you. It is comfortable and absorbs you a little, but the hybrid technology does mean that the springs support you and you never sink too far. The encasing of the coils in memory foam means that even the heaviest of users would never sink too far into the bed while simultaneously preventing you from ever actually feeling a spring dig into you. Overall, the Helix Nightfall is a comfortable mattress for those that like a moderately firm bed. Hybrid mattresses with pocketed independent coils are a huge improvement on a traditional innerspring but not quite as good as an all foam. The motion transfer on this mattress is pretty good. You will not feel a ton of movement but will feel some. It’s not something that should be concerning or make your choice difficult. For a heavier person I would not recommend an all foam mattress anyway. Off-gassing is a little of a deceptive term since anything you buy from anywhere is going to smell of the place it has been stored. It is similar to a new shoe or a new car smell and is noting to worry about. 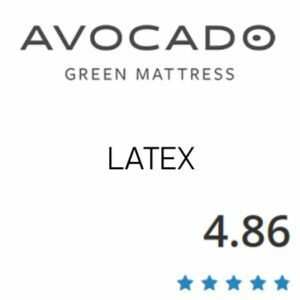 Interestingly it tends to be natural and organic mattresses that smell the most since these are made from materials that off-gas naturally over time. You won’t need to worry about this with the Helix Nightfall however, and we noticed almost no smell at all. Off-gassing is nothing to worry about, but any smell shouldn’t linger longer than 36 hours. If you put your mattress protector and your sheets on you shouldn’t even notice it at all. It has usually gone by the time you have owned the mattress for a day so do not panic. The Helix Nightfall is unlikely to smell but if it does it won’t take long to start smelling of your own home. Since those encased coils are supported by heavier, denser memory foam than the rest of the bed that means your outside edge is more solid than the rest of the bed. You will sit, you will sink a little – but you will always be able to feel the edge of the mattress and you won’t roll off it in the night. You are far more likely to roll into your partner on the other side of you. Edge support is good on this mattress! The Helix Nightfall stands at 12 inches and of course has that dual cover as a top layer. The cover promotes breathability and stretches with the mattress to ensure that long term you don’t experience any sagging. It helps airflow underneath you that is designed to work with the top 1 inch layer of Helix Dynamic Foam – their patented, breathable latex-foam mix. 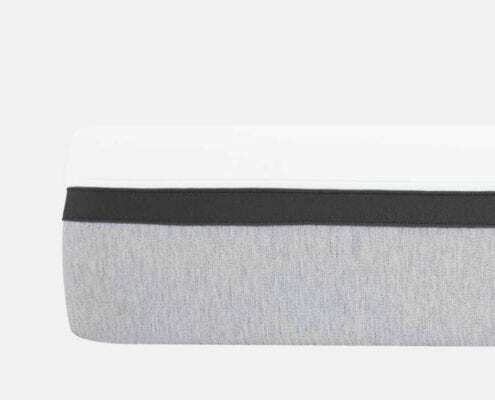 The next layer down contains a 1” layer of ultra-dense memory foam. 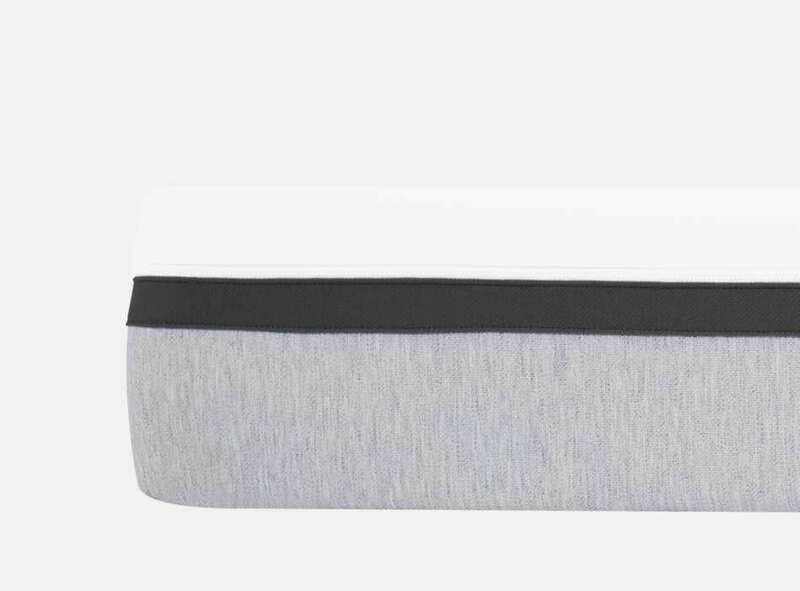 This layer is designed to ensure that you get that sinkage you would expect from memory foam and to contour to your shape and support your body. Afterwards another 1 inch layer high-grade, medium density polyfoam. This layer is the extra, built-in support for those of a heavier frame and should help with shaping to your body without having any of the springs stick out into you. Naturally the springs are located in the layer beneath. This layer is roughly 8 inches thick and sports coils wrapped in memory foam and supported with Dura Dense foam underneath to stop it loosing shape. This base layer is another inch thick, thus completing the 12 inches. The Helix Nightfall is constructed entirely in the USA to save on costs, delivery times and carbon footprint, and we like how they have considered all of these aspects during construction. It is a high quality product that has been built to last. 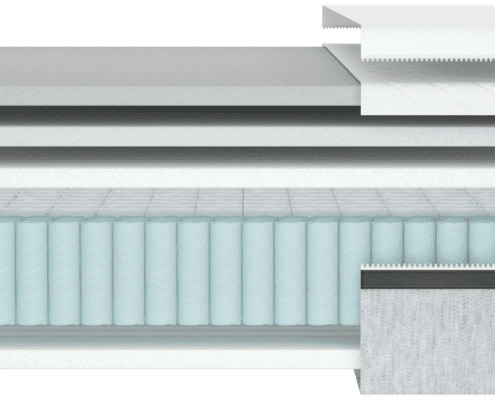 As we mentioned before, all Helix mattresses come with the in-built attention to detail that Helix apply to temperature regulation in all of their mattresses. The two part cover design means that the air flow through this mattress is promoted. Additionally, the separation between the coiled springs and between the layers of this design makes for a cooler night than you would expect. 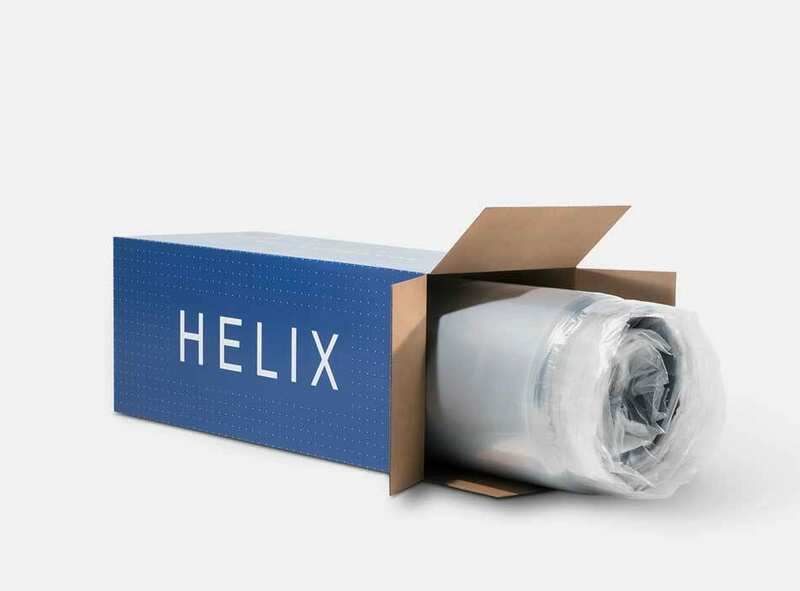 Memory foam doesn’t lend itself well to high breathability so the Helix team have achieved a reasonably good job in spite of the unwillingness of the material they work with. 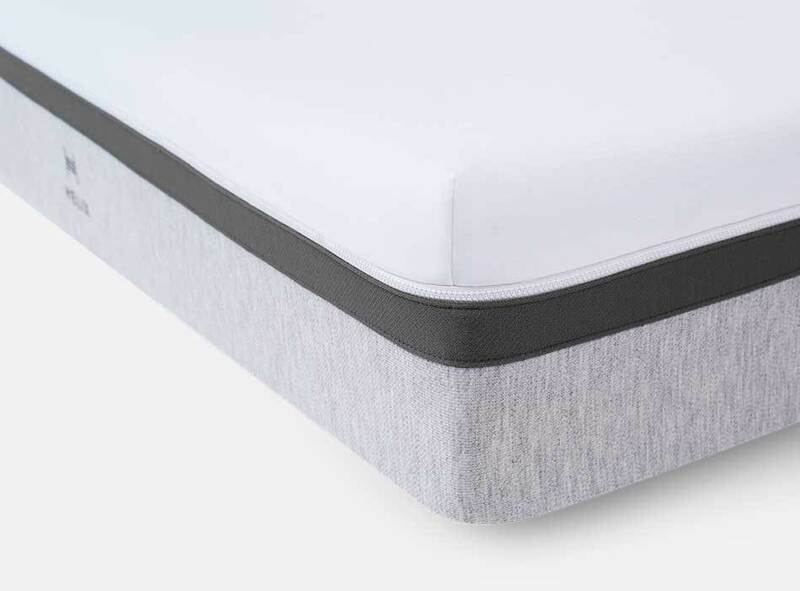 That top cover has been engineered to make sure that it both stretches around the mattress as it molds to your shape without becoming saggy or clinging to you, while the lower part ensures the air can escape. That smooth top layer not only feels good against the skin but it keeps wicking away moisture all night long so you are never too hot when you wake. 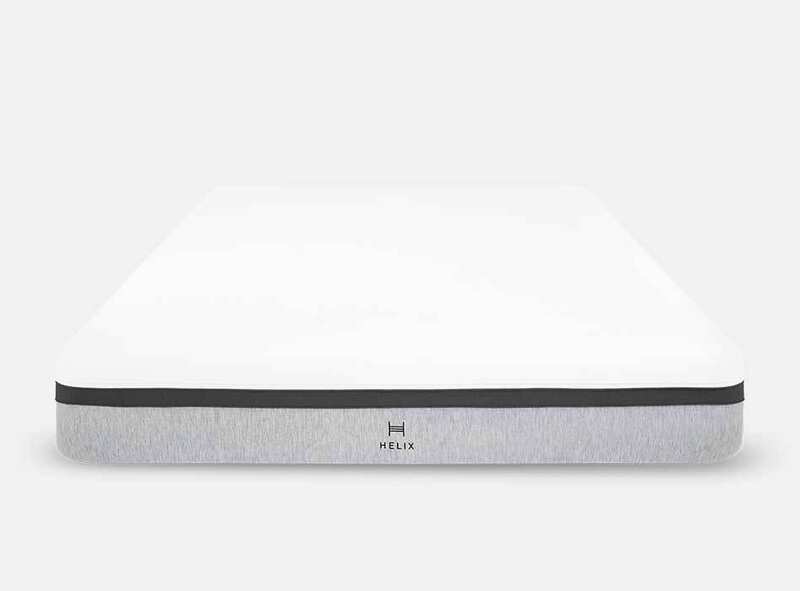 Helix Sleep offer some great trials and warranties on their mattresses so we were a little surprised to see that this mattress comes with a 100 night risk free, no obligation trial of the mattress. While this is a fairly good deal it is industry standard… meaning that it’s pretty much the same deal as you would expect from the other big brands. In fact; we have almost become used to the extra 10 nights most are now offering. As for warranty; the Nightfall comes with a ten year guarantee. While this also sounds great it is the same result as last time. We like to see lifetime guarantees to score that perfect ten. We did also notice that they throw in free shipping which is a nice touch. Their warranty covers things like sagging (as long as a proper base has been used) tears in the fabric and indentations that won’t go away – basically any construction defaults with the bed. If something does go wrong, however, they will pick it up and replace it all for free.